"How can you poach an egg without vinegar?" you might wondered. The idea of poaching an egg might seem difficult to most of us, whether it is the fear of getting it wrong, fear of turning it into egg drop soup, fear of unpleasant vinegar taste, fear of solidifying the yolk or simply fear of wasting an egg. In my case, it would be the first three. Let me know what do you fear the most about poaching an egg. 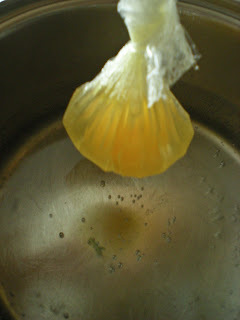 Poached eggs are not that hard to make, provided that you forget the traditional techniques of pouring some vinegar in a large pot of boiling water. You won't even need to invest on a $20 egg poacher. This trick is neat and foolproof, I even got it perfect the first time considering that I never poached an egg before. You might have noticed that the shape of the egg white is not oval nor smooth like the classic poached eggs. The shape looks like a Chinese steamed bun. All you need basically is a plastic wrap, a teacup, and simmering water. After reading this tutorial, you will no longer fear of making poached eggs anymore. You will get addicted of making it every breakfast. Update March 13, 2010: This technique is definitely foolproof, check out the poached egg made by Laura Jeanne, author of A Healthy Jalapeno. Update March 16, 2010: This technique has also been used by fellow blogger, Lena from Frozen Wings. 1. Bring a pot of water to boil, then turn heat down to a simmer. 2. 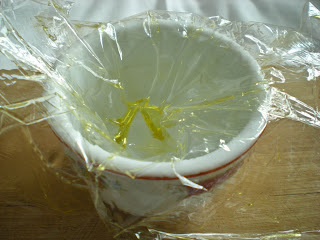 Lay out a plastic wrap on top of a teacup or ramekin, about 5-6 inch square. Lightly rub olive oil on the plastic wrap. 3. Push gently onto the teacup and then crack the egg. 4. Pull wrap upward. Twist and tie a knot together tightly. 5. Drop egg in simmering water. Simmer for 4-5 mins or to your liking. 6. Take out poached egg with slotted spoon. 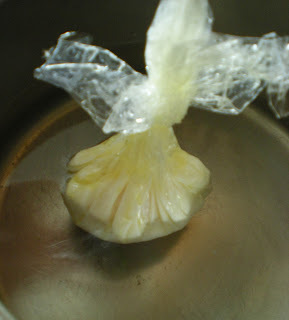 Remove plastic wrap with scissors. Serve on toast. Season with salt and pepper. Lovely and I am going for sure try this. My hubby loves eggs cooked this way. 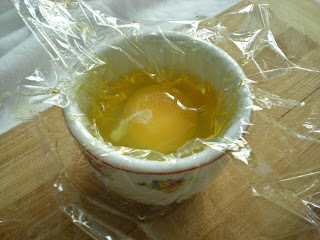 Thanks for sharing how you poached the egg in the plastic wrap :) Very interesting! This looks perfect... great idea..
thanks for sharing this, it's easy..yeah, the egg also looks like 'har gao'! Now that is brilliant, Victor. So easy! I always fear that the egg will just turn into a complete mess once dropped into the pan. Never again! That's very clever, Victor. Nice idea. Thanks for sharing. Wow thats truly brilliant, thanks for sharing..
What a genius idea! I've always poached an egg free of vinegar, but usually end up losing some white in the process, so this is a great way to not lose anything! I love, love, love this - no more trimming egg whites. On my agenda for the weekend! Genius! 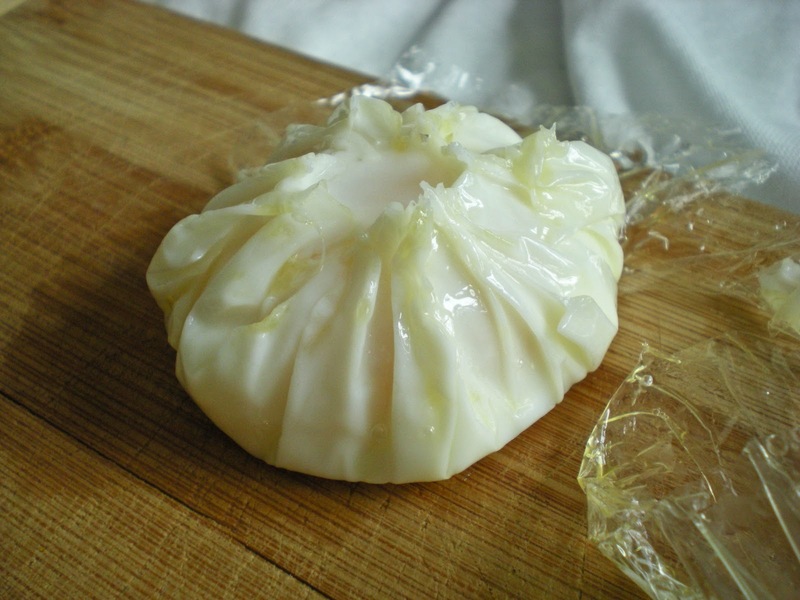 I had tried this technique before and my plastic wrap broke, which made a big mess; then I discovered an easy alternative: poach an egg in the microwave in a small cup with a bit of water, the egg was cooked in 25 seconds. No vinegar no oil perfect! Great idea! looks good, it's making me hungry for breakfast! WOW! 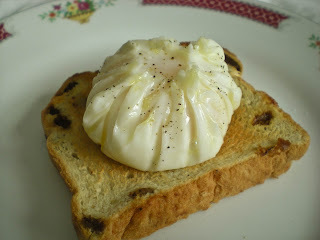 I love poached eggs; I have tried every way possible. This I have never seen; perfect and fantastic!Can't wait to try it. What a great idea! It looks perfectly poached. What a cool way to make poached eggs! My mom had a little egg cooker and made them often but I have never done it. Thanks for visiting my blog at www.twelvemakesadozen.blogspot.com Let me know if you like my sourdough recipe! My 12 kids think it's amazing. Very clever, but I worry about cooking in plastic wrap. Good tutorial! The egg looks like a small chinese 'bao' with gold treasures in it! Do you use the microwaveable cling wrap for this? I usually poach the eggs in a microwave. Impressed for sure, but even more impresssed that you used cling film to pouch your egg. This is a great idea Victor! I will give it a try! Very clever, Victor! I use the swirl technique but am going to try your method the next time. It looks no-fail! I never heard of this technique, seems something worth experimenting. There is nothing to worry, simply use a heat-resistant plastic wrap. Don't forget to oil it! Yes, this is what I use. Ah, I've heard about this technique. It looks like it really works! Everything genius is simple :) I love poached eggs, and I'll give this method a try! This is a fantastic technique. Eggs Benedict is one of my favorite indulgences, so I am very pleased to see an easy way to poach my eggs. I also like the shape of the egg - it looks almost like a flower. Me encantó la técnica del huevo,se ve maravilloso,me gusta el huevo reventado encima del pan,es muy original,abrazos y cariños. Sooooo, I did it! And it was the easiest egg I have ever cooked plus the taste was delicious. Thank you so so much. If your interested to read my thoughts I posted your recipe on my blog to share (of course giving you full outstanding credit) and I couldn't be more thrilled about the results. Oh my gosh, this is genius! 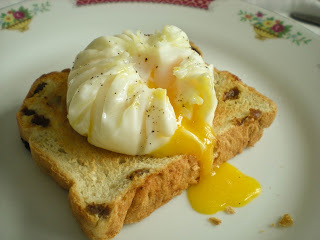 I absolutely love poached eggs on toast for breakfast and will be trying this soon. I love the shape too - it's even prettier than a regular poached egg. Do you think this would work with out the oil? I can't have any fat (like at all... i can't process fats) and I really wanna try this! 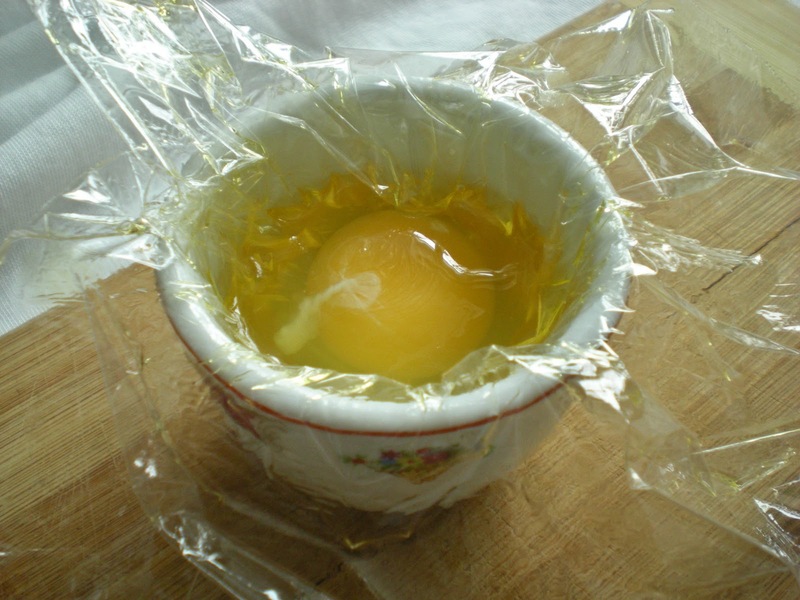 Unfortunately, it requires a thin layer of oil to avoid sticking to the plastic wrap if you want the perfect poached egg. Otherwise, the egg whites will stick to plastic wrap. In a sense, this technique still works but you have the poached egg from the plastic wrap. Too funny I have been also using this method for 1 year. It really is such a foolproof method, that works every time. I never attempted poached eggs because they looked so complicated but now I make them all the time. Thanks for the tip on the oil, will try it next time. Absolutely brilliant! Tried other methods and could not seem to get it right. Used your method and got it right the first time! Thank you! Hi Dee, Thanks for passing by my blog. Actually, if you read the instructions carefully, you poach the egg in simmering water. The water is far from the boiling point temperature. Not sure why you would worried about chemicals, everyone uses plastic to cover their food. I'm a scientist myself. Very clever idea! I like how the finished egg looks a bit like a wonton (shape-wise) due to the twisted plastic. Thanks for this vinegar-less alternative! Thanks Victor for the idea. I was craving for egg Benedict this morning but didn't have vinegar on hand. Found your article and successfully made myself a full egg Benedict Bfast.